In the world of “I want it now” there are fewer issues that cause as much frustration as a broken printer or your inbox not doing what you want. While I cannot help you with printer problems, I will help with your inbox. Today you will learn about two very useful and very under-utilized filters available inside your Zimbra hosting with XMission. Zimbra documentation on filter usage is pretty meager but while digging around in my preferences and testing some filters I found 2 really great gems built into the system. I will share them with you now. They are attributes to the “Address In” filter option and are called, My Frequent Emails and Contacts. What are these filters and what do they mean? Effectively, both of these email filters will prioritize common and expected emails to your inbox. Awesome! It is easy and fast to implement these filters into your setup. You can create a unique filter for each of the filter attributes or you could pair them into a single filter. For the purpose of this post I will pair them into one filter. Creating a new filter using the “Address in” attribute. 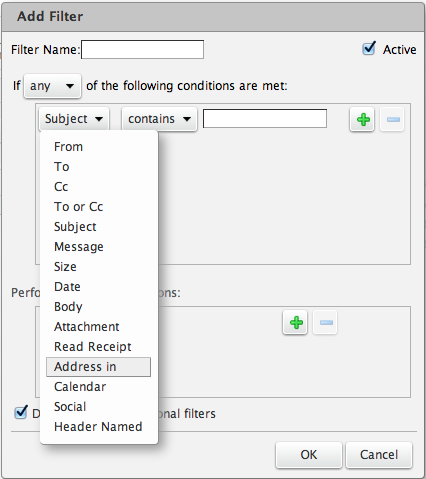 Choosing filter attributes inside Zimbra Preferences. 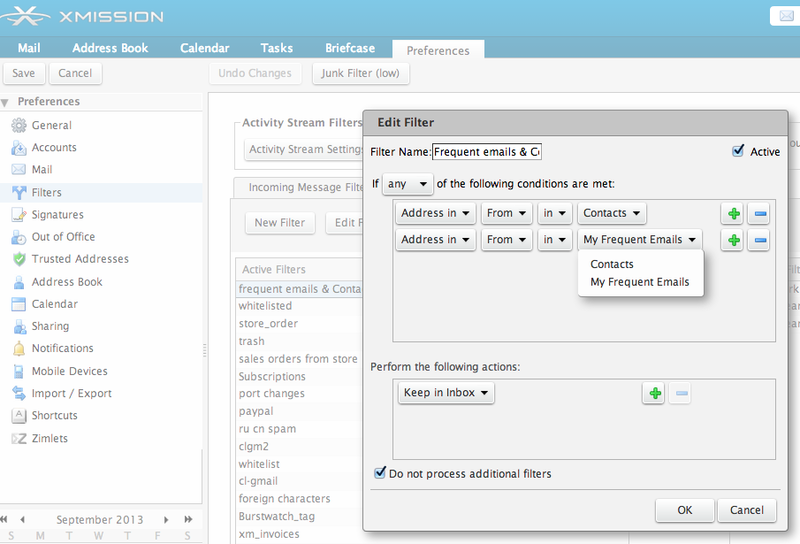 To create a filter you need to login to the webmail at https://zimbra.xmission.com. Find and click on Preferences tab then move down the left side of the page to find Filters and then select New Filter. Now we name the filter. I will create a filter called Frequent Emails & Contacts but you can name it anything you want. Click on the Subject drag-down menu and select Address in option. Then From and In should be the default options. Use to the drag down to select Contacts or My Frequent Emails. Power users might use separate filters for each so you can prioritize their application ranking inside your filter list. In this demo I have placed the filter at the top of my filter priority list. Once you have created the filter now you need to hit OK and then do not forget to finalize the changes made by clicking on the Save button in the top left of your webmail window. Try this out and see how you like it. Share with me what you notice in the comments below. Have any other questions or use tips you would like to have me write about. Please leave those in the comments below as well. PS. Don’t forget to follow, like, circle, and otherwise fawn over us on the social media links below. How do I tell Zimbra to run filters for the existing messages on my Inbox? You will see a Run Filter Progress pop-up that will display the filter status as it is applied to your selected folder. Depending on the size of the folder it may take some time to run. You can always select the Run In Background option and go back to your mail session. That is it. You can run this process against any new or existing filter at your convenience. Zimbra is packed with powerful tools.